Dries Van Noten, SS16, Paris. A few years ago now we did an article that asked How Many Fabrics in the Dries Van Noten Show? and laid out the collection as swatches. 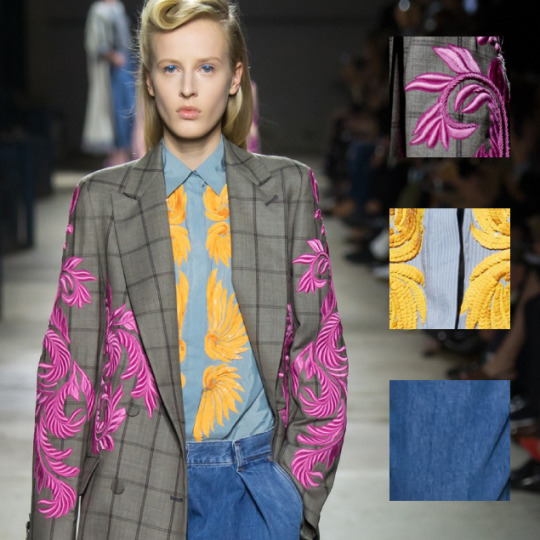 Since the Dries Van Noten show for Spring-Summer 2016 was again filled with an amazing range of different prints, colours and textures it seemed like time to do this exercise again, and to this time explain how looking at a collection in this way almost takes you back to the initial design stages of a collection. 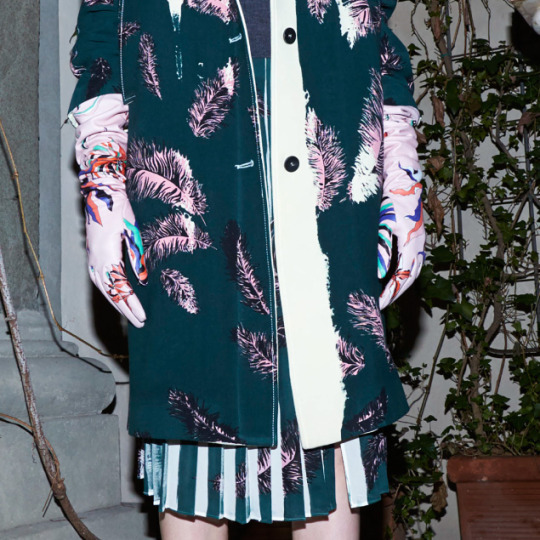 When you flick through the images of the garments from the catwalk show, the Dries show has that quality where you feel like you’re seeing individual people walking down the street, each with their own style and way of layering clothes and colours together to suit their own bodies and complexions. The initial effect is of an almost endless multitude of different fabrics. Of course even when just skipping from one image to the next obvious themes of colours and motifs emerge – like that shocking pink and the glimmers of embellishment – but the overall effect is that each piece feels very individual with its own print or colour combination. It is only once you start to look at the fabrics by themselves that you begin to see how the fabrics explore certain motifs and colours in shifting variations of scale and tone. There’s still an incredible number of fabrics (we lost count at 90) but they are actually all related to each other. A leaf shape appears on a mesh for body skimming garments, then on a chiffon for blouses, and then enlarged in scale as an embroidered motif on tailoring. The colourways reference each other too, different tones of golds and blues play off each other across different fabrications, sometimes shifting into teal on beige. Interestingly, the shocking pink is actually used relatively sparingly in the garments themselves and is offset by lots of earthy tones. 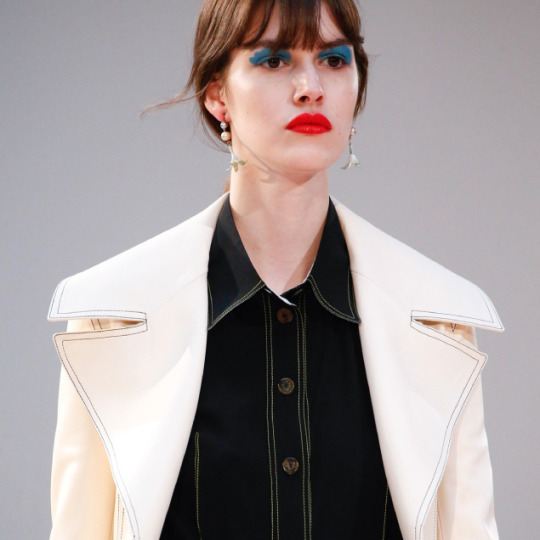 You also get a sense of how the overall collection was styled to give the catwalk show a certain arc, moving from bright pinks, aquas and yellows through to vibrant purples and dark reds and finally into moodier blacks and shadowy greens. Essentially, there’s lots of thoughtful coordination within the chaos, and the randomness actually sits within a set of boundaries. By taking away all of the garment shapes and the styling to focus on only the fabrics it is almost like going back to that initial phase in a design room where the designer just has a few sketches and a pile of fabric swatches from the mills laid out on a table. Not that all designers work in this way, or even to say that this has been the process in this collection, but for many designers getting the range of textiles right helps to solidify the concept for the collection. To put this another way, sometimes it seems like designers get to the end of the sampling process with a whole range of garments and then “pull it all together” with styling, like you would with a wardrobe full of clothes. On the other hand, some designers appear to make it all work at the beginning when the collection is just a pile of swatches. If you’re a designer working on your own collection then this initial layout of swatches can be used to balance the collection before you’ve even sewn up a garment. Are there enough pop colours? Do we need more neutrals? Do we need to mix up the textures? More sheer, less opaque? More matte less shiny? Can we afford all these embellishments? etc. If your collection fabrics wouldn’t work as a crazy patchwork quilt, then maybe they’ll look disconnected once they are sewn up into garments.